Sachin C. Ketkar, a bilingual writer, translator, editor and critic, was born in Valsad, Gujarat in 1972, and completed most of the schooling there. He did his Masters in English Literature from the Maharaja Sayajirao University of Baroda, Vadodara, where he presently teaches. His books in English include Skin, Spam and Other Fake Encounters: Selected Marathi Poems in translation, (2011), (Trans) Migrating Words: Refractions on Indian Translation Studies (2010), and Live Update: an Anthology of Recent Marathi Poetry (2005) as translator and editor. His Marathi books are Jarasandhachya Blogvarche Kahi Ansh (2010) and Bhintishivaicya Khidkitun Dokavtana,(2004). His poetry, critical writings and translations have appeared in reputed English and Marathi journals like New Quest, Indian Literature, Little Mag, Abhidhanantar, Khel, Mouj, Poetryinternationalweb. Com, Cerebration. Org, Muse India and so on. He won ‘Indian Literature Poetry Translation Prize’, given by Indian Literature Journal, Sahitya Akademi, New Delhi in 2000. 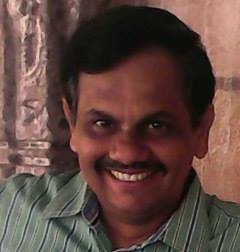 He works as Professor in English, Faculty of Arts, The Maharaja Sayajirao University of Baroda, Vadodara. He blogs at www.sachinketkar.blogspot.com. His poems have been translated into Gujarati, Hindi and Telugu. He has read his poems and translations at several places like Kavi Bharti-5, Bharat Bhavan, Bhopal, 2010, SAARC Literary Festival, Agra 2009, SAARC Young Poet's Meet, Puri, 2008, Kala Ghoda Festival, Mumbai, 2008, Akhil Bhartiya Marathi Sahitya Sammelan , Nashik, 2005, Keshavsut Poetry Festival, Aurangabad, 2005, Loquations & Chauraha , NCPA, Mumbai 2005, and Corpus Christi College, Oxford in 2000. He has extensively translated present-day Marathi poetry, most of which is collected in the anthology Live Update: An Anthology of Recent Marathi Poetry, 2005 edited by him. Along with numerous recent Gujarati poets, he has rendered the fifteenth century Gujarati poet Narsinh Mehta into English. He has also translated the work of the well-known contemporary Gujarati short story writers Bhupen Khakakar, Nazir Mansuri and Mona Patrawala. His critical writings and translations have appeared in reputed English and Marathi journals.